St Stephen's Catholic College is administered by the Catholic Diocese of Cairns and provides a quality Catholic secondary education for students in the Tablelands, Kuranda and Mossman areas. The college has a stable staff who reside predominantly in the Tablelands area. With the relocation of a historic chapel to the college site in 2015, there is now a sacred space for staff and students to further develop their faith formation. Situated on 28 hectares on the outskirts of Mareeba, St Stephen's Catholic College focuses on providing opportunities for young men and women to achieve their personal best. The college provides a holistic curriculum to enable students to grow academically, socially, emotionally, spiritually and physically. Students are viewed as life-long learners who will be given opportunities to utilise their talents by being a presence of Christ in our world. Our parents value the firm boundaries, excellent learning environment, quality teaching and the modern facilities which our College offers. Fostering a sense of family has been an integral part of St Stephen's since the foundation years. This connectedness with families and the wider community is based on shared values and translates to forming a school culture that enhances student achievement in a holistic manner. In 2015, the college also formed a sister school agreement with Sano Nihon Daigaku Secondary College in Sano City, Japan. This will strengthen cultural ties between students in both schools. In 2017, the year 12 cohort achieved outstanding results. While 100% of students attained a QCE (Queensland Certificate of Education), 40.48% of the 42 OP-eligible students achieved a score between 1 and 5 and 92.86% obtained a result between 1 and 15. This placed St Stephen's in 13th in the state based on the percentage between 1 and 5. There was also 100% of QTAC applicants with a tertiary offer. 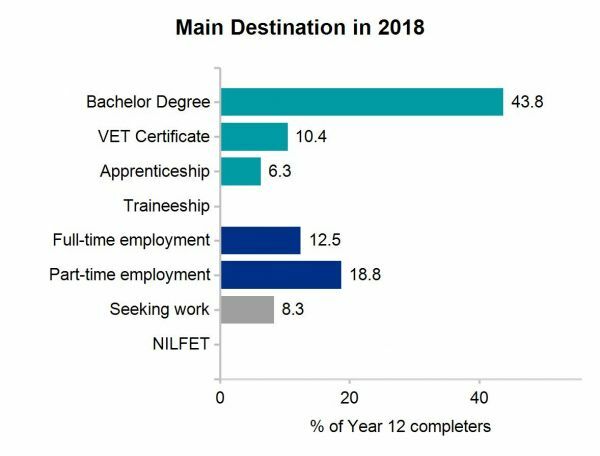 In terms of VET (Vocational Educational and Training) 22 out of 67 students completed a VET certificate with 6 students in a School Based Apprenticeship/Traineeship. Core classes in Mathematics and English are purposefully grouped to provide opportunities for extension or learning support. Electives are studied for one or two semesters in year 9 and for both semesters in year 10. Students choose two electives from a range of options. Students may choose authority subjects contributing to an over all position (OP) or authority-registered subjects which are geared towards a vocational pathway. Students may also access certificate courses through an outside provider such as TAFE and participate in School-based Apprenticeships and Traineeships. Opportunities exist for students to study subjects not offered by the College through an external provider (School of Distance Education) or through online courses. The college is currently preparing for the implementation of the new QCE system with year 11 in 2019 when both the current (with year 12) and the new system are in operation. An emphasis on being a part of the college family and community. A welcoming culture that promotes positive relationships. A co-educational school which affirms the equality of persons. An acknowledgment of achievement in all aspects of college life. The college focuses on developing partnerships between students, teachers and carers. Students are encouraged to build successful relationships, communicate effectively and achieve their personal best. Development of respect for others, responsibility for one's learning and the development of confident, young people who are morally autonomous and have an awareness of God's presence. There were no areas identified as requiring attention or immediate action. Survey responses were received from 56 out of 74 eligible respondents. This equates to a response rate of 76%. Staff recorded an overall satisfaction score of 82%. Student attendance is effectively monitored with students expected to participate in all curricular and co-curricular activities offered by the College. Parents are required to notify the College by 8.30 am of their child's absence. All unexplained absences are followed up by the office staff. With the offering of Music from years 7 to 12, choices for students have been expanded. The survey response rate from students was 85%. The College achieved an overall satisfaction score of 71%. Key feedback areas included: Catholic Ethos, Leadership, Resources, Improvement Processes and Learning and Teaching. Fair to good areas included: Resources, Learning and Teaching, Leadership, Catholic Ethos and Improvement Processes.